I’ll use Silex, Twig, Bootstrap and NeoClient to build the application. Create a directory for the app. I named mine spsocial. 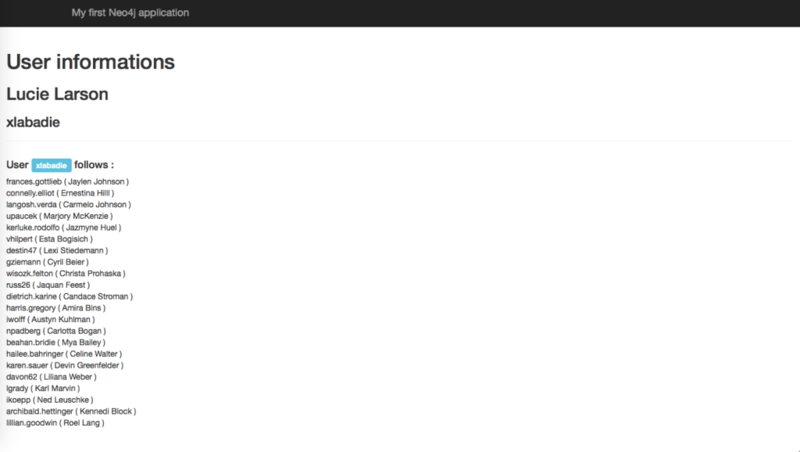 You can download and install Bootstrap to the web/assets folder of your project. Twig is configured to have its template files located in the src/views folder. A home route pointing to / is registered and configured to use the WebController we will create later. 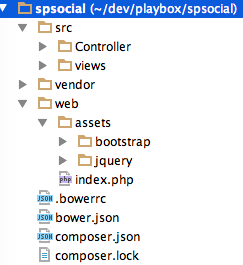 Note that here I used bower to install bootstrap, but it is up to you what you want to use. The next step is to create our base layout with a content block that our child Twig templates will override with their own content. So far, we have Neo4j available in the application, our base template is created and we want to list all users on the home page. The controller shows the process, we retrieve the neo service and issue a Cypher query to retrieve all the users. 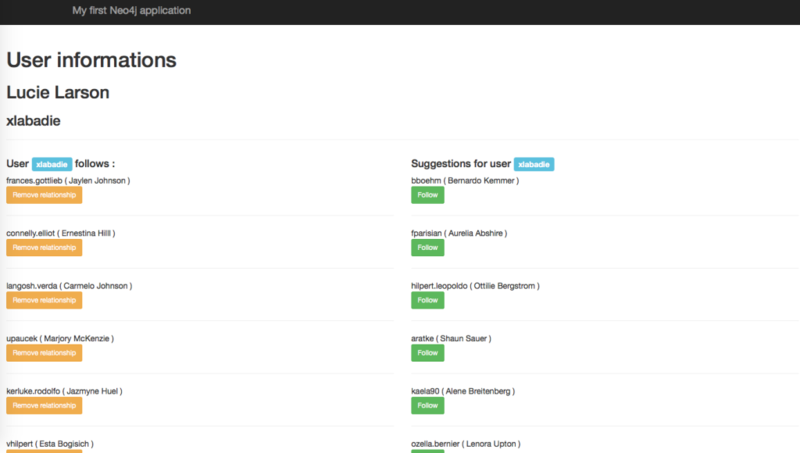 The users collection is then passed to the index.html.twig template. The template is very light, it extends our base layout and add an unsorted list with the user’s firstnames and lastnames in the content inherited block. Let’s say now that we want to click on a user, and be presented his detail information and the users he follows. The workflow is similar to any other applications, you try to find the user based on the login. 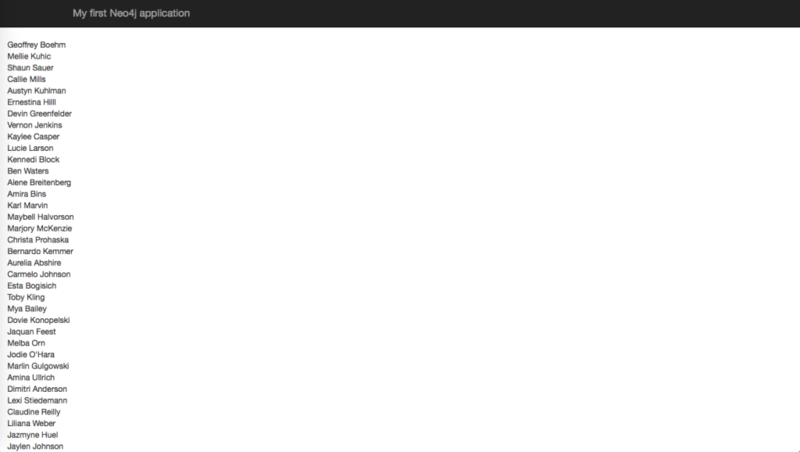 If it does not exist you show a 404 error page, otherwise you pass the user data to the template. The next step is to provide suggestions to the profile. We need to slightly extend our cypher query in the controller by adding an OPTIONAL MATCH to find suggestions based on the second degree network. 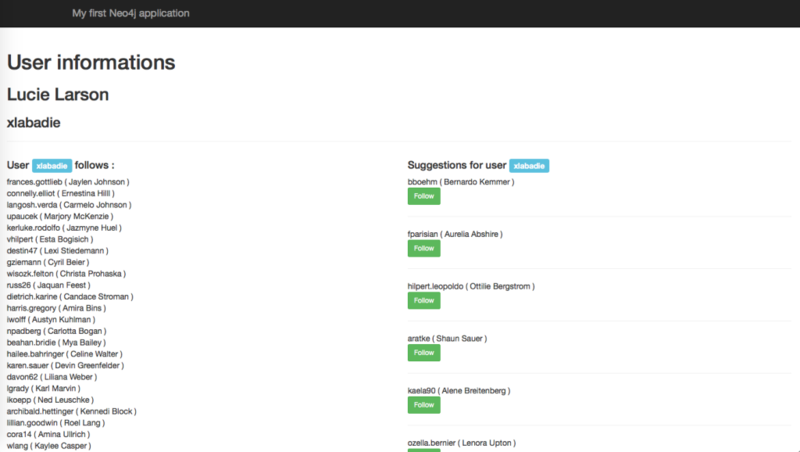 In order to connect to a suggested user, we’ll add a post form link to each suggested user containing both users as hidden fields. We’ll also create the corresponding route and controller action. Nothing unusual here, we MATCH for the start user node and the target user node and then we MERGE the corresponding FOLLOWS relationship. We use MERGE on the relationship to avoid duplicate entries. and I added an identifier follows to the relationship to be able to DELETE it. Graph databases are the perfect fit for relational data, and using it with PHP and NeoClient is easy. Cypher is a convenient query language you will quickly love, because it makes possible to query your graph in a natural way. 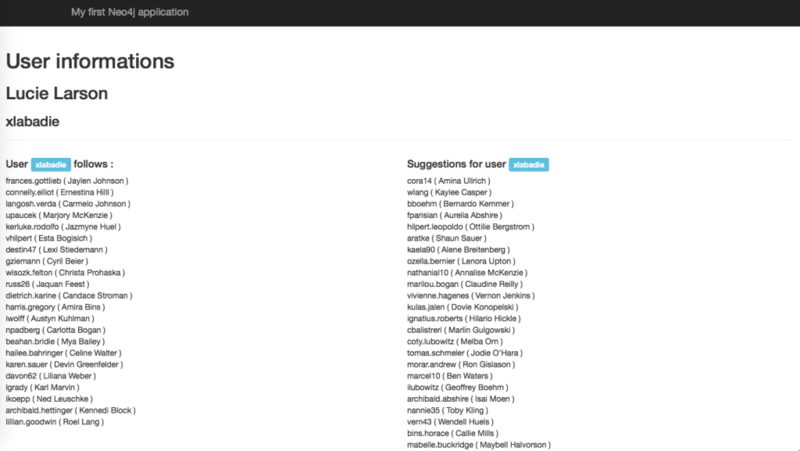 having a look at use cases and examples supplied by Neo4j users and following @Neo4j on Twitter. Nice article, thanks. I'm interesting in graph database and Neo4j including. But have some questions about your article. 2) What about performance, resources using and clasterization possibility? 3) And at all, can it be considered as an alternative to elasticsearch for example in fulltext/facet search? 1) No there is no magic, the suggestions are the nodes that you tell Cypher to return, you can also increase the relationship depth to provide friendOfFriend or friendOfFriendOfFriend suggestions. 2) Performance is always relative to how optimized is your model and how optimized are your queries. The Neo4j has better performance however when the graph can fit in memory, meaning that it is usual to have at least 16go memory reserved for the Java heap of the Neo4j server. Clasterization or clusterization ? Neo4j Enterprise has an HighAvailibility mode, more informations in the documentation. 3) Currently, no, the fulltext feature are possible but are using an index that will be deprecated in the future. So before Neo4j 2.3 is released, ES is a common add-on we use with neo4j.